Striker Sam Vokes is hoping to get the chance to fire Wales to the victory that will guarantee Ryan Giggs’ side top spot in Group B4 of the Nations League – and a Euro 2020 play-off game, should they not qualify automatically. Wales host Denmark at the Cardiff City Stadium on Friday evening (kick-off 7-45 p.m.), with Vokes pushing for a start for his country after holding down a spot in the Burnley side for the last seven Premier League games. He netted the winner at the Cardiff City Stadium against Neil Warnock’s Bluebirds, and the opener in the home draw with Huddersfield Town. And he also headed a fine consolation for Wales in the 4-1 defeat to Spain last month. However, that appearance, his 60th for his country, was his only international outing so far this season, with Derby County forward Tom Lawrence now regularly getting the nod with Gareth Bale. Vokes, who recently turned 29, is happy to see the new breed making their stamp on the Wales side,with the likes of Liverpool’s Harry Wilson, currently on loan at Derby, Bournemouth midfielder David Brooks and Chelsea midfielder Ethan Ampadu emerging on the scene. 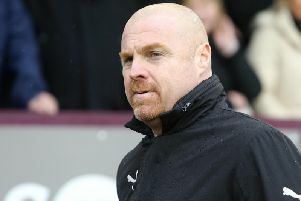 And the former Wolves man, who recently signed a new three-year contract at Burnley, said: “I’ve been around Wales for a long time now and been part of some good squads there. “I think it is sort of a bit of a transition there at the minute where the young lads are coming through. “I feel like one of the old boys there. “But it’s great really, it’s competition for everyone and can only make us stronger. “They’re a great group of lads and have experience at the top level themselves at the minute. Wales host the Danes tonight, having beaten the Republic of Ireland 4-1 at home and 1-0 away, while losing 2-0 in Denmark in September. But Giggs’ men will top the their group in the new Nations League competition if they claim three points in Cardiff against the World Cup Finalists tonight, and Vokes said: “It’s a big game for us. “For the manager it’s the first competitive group to be involved in, so to top that against two top sides in Ireland and Denmark would be great, and it’s a chance for us to do that against Denmark. “I think the performances have definitely been there, maybe apart from Denmark away, but it’s been a good campaign – one we’re building on for the next group stage as well. “It’s a good group of lads coming through which showed in the performance against Ireland, especially last time. Denmark, who beat Wales with two Christian Eriksen goals, would top the group if they win in Wales, or if they draw, then beat Ireland on Monday. l In the UEFA Nations League, 55 nations were split into four leagues, according to their position in the UEFA National Team Coefficient Rankings. A draw divided each league into groups of three or four, with , playing home and away. The group winners in Leagues B, C and D gain promotion, and those who finish bottom of the groups in Leagues A, B and C are relegated. Four group winners from League A qualify for the UEFA Nations League finals in June. The knockout tournament will be hosted by one of the quartet, with the draw in early December. Euro 2020 qualifying initially remains largely the same, until the play-off round. Previously contested by teams finishing third in their group, that stage will now involve the 16 UEFA Nations League group winners, or, if they have already qualified, the next best ranked team in their league.